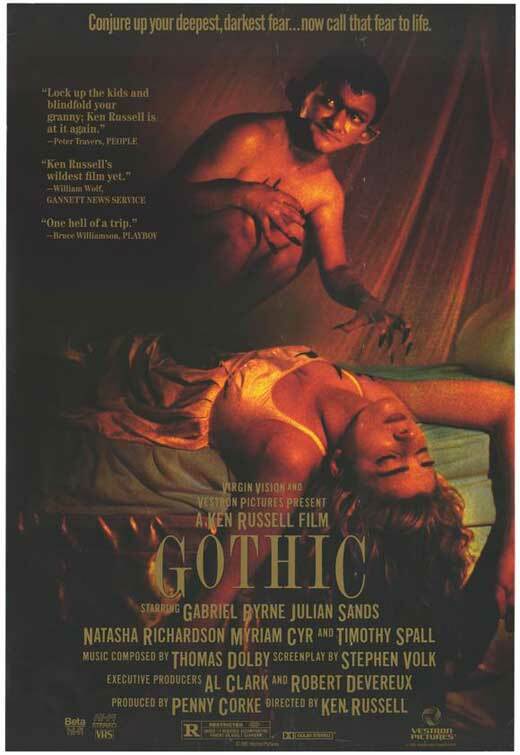 Gothic is another one of those films that you either love or hate. I enjoyed the hell out of it. The story of how Frankenstein and the Vampyre came to be? Ken Russell as the director? Gabriel Byrne as Lord Byron, Julian Sands as Percy Bysshe Shelley, and an absolutely lovely Natasha Richardson as Mary Shelley (in her film debut)? Music by Thomas Dolby? What's not to love? Well plenty it seems. The movie was a commercial bomb, though it did make good money on the home video market. Connor hated it. Though he did recognize Timothy Spall who played Dr. John William Polidori here and later Peter "Wormtail" Pettigrew. I watched this a few Challenges back but for the life of me I can't find the write up. My wife hated it then too. It does feel dated and the music is very much mid-80s synth. But it is still a lot of fun. You regularly mention Connor as of late. Who is Connor? I loved this in the early 90s and assume it still holds up. Need to re-watch this! Connor is my teenaged son. We are watching these together.